Jemp is known to travel in a wide range along Florida’s west coast. He has a scar pattern that makes him easily recognizable to manatee researchers. Jemp was first identified in 1990 by researchers at Mote Marine Laboratory during a photo-identification study in Sarasota Bay. He is a male manatee and was named for Jenny, Elizabeth, Mary, and Peggy – four volunteers who were present when he was first documented. Jemp is known to travel in a wide range along Florida’s west coast. 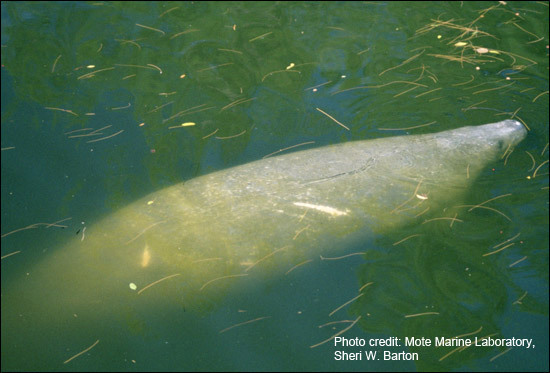 He has a scar pattern that makes him easily recognizable to manatee researchers, which is a large white scar on his right mid body, another smaller scar behind it, and other scar patterns on various parts of his back. Using tagging and photo ID data, Jemp has been documented traveling along Florida’s central and southwest coast from Tampa Bay south to the Everglades! In July of 1995, Jemp was rescued after being exposed to red tide. Red tide is made up of millions of tiny marine organisms called dinoflagellates. Under certain conditions, dinoflagellates “bloom” and the water can appear red, even from outer space! Unfortunately, these particular dinoflagellates also release a toxin that affects the central nervous system of species, including manatees, birds, fish, and humans. Red tide causes seizure-like symptoms that can lead to drowning if affected manatees are not identified and assisted by trained personnel. Since 1996, hundreds of manatees have died from exposure to red tide. Fortunately, someone spotted Jemp struggling in the water when he was affected by red tide, and he was rescued and treated at ZooTampa at Lowry Park. After the red tide bloom had ended, Jemp was fitted with a tracking device or “tag” and released. He remained tagged — first as a rehabilitated manatee and then as a participant in a manatee research project to identify travel corridors, feeding habitat, and warm-water refuges along Florida’s west coast. After Jemp’s tag was removed in 1999, there was a period of seven years where he remained incognito, and he was not seen from 2002 to 2009. But researchers were excited when he popped back up again in a mating herd near Sarasota in April 2009. Then came record cold temperatures in Florida in the first months of 2010, which caused unprecedented levels of manatee mortality and was followed by another unusually cold weather period in December. Thankfully, Jemp was spotted twice in late May and again in early June 2010 in Pansy Bayou, just off Sarasota Bay, so we knew he had survived the chilly weather. Jemp has often been spotted in mating herds. Recently, in June 2015, Mote Marine Laboratory researchers observed Jemp participating in a mating herd in Sarasota Bay. 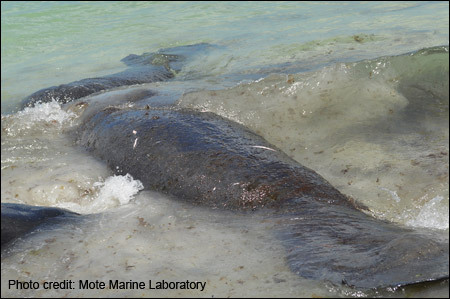 Mote Marine Laboratory staff also sighted Jemp and fellow Tampa Bay adoptee Vector in a mating herd in April 2016 at Coquina Beach on Anna Maria Island. There were 24-26 manatees present in the herd. Florida Fish and Wildlife Conservation Commission (FWC) staff member, Kane Rigney, was able to capture it on video (see video below). Jemp was seen again in a mating herd in July 2016 off Siesta Key in Sarasota County by Mote Marine Laboratory staff. It is important to remember that if you spot a manatee mating herd, please keep your distance and call 1-888-404-3922 to report the sighting to the FWC. Mating is an important activity for manatees, and it is considered harassment to disturb this process. Remember to always give manatees space and observe from a distance. Each person who adopts Jemp will receive a full-color photo, biography, and adoption certificate, as well as a membership handbook and subscription to The Manatee Zone, a newsletter featuring updates on the adopted manatees when they are sighted, and Paddle Tales, Save the Manatee Club’s bi-monthly eNewsletter. For more information about adopting Jemp, go to Save the Manatee Club’s Adopt-A-Manatee page, or call 1-800-432-JOIN (5646). Watch a video of a manatee mating herd captured by Kane Rigney of the Florida Fish and Wildlife Conservation Commission. Jemp and fellow Tampa Bay adoptee Vector were spotted in the mating herd on April 2016 at Coquina Beach on Anna Maria Island. There were 24-26 manatees present.